The early teen years are often an ideal time to correct your child’s teeth. Sometimes, it’s the first treatment they’ve had, other children, however, have had one or more phases of orthodontic devices to correct a small jaw or severe overbite. The teen years are a time kids start taking responsibility for their own hygiene habits, for good or ill, and a period when their personal image begins to mean more to them. Traditional braces, though a proven treatment, have their drawbacks for a teenage patient: the look can be unflattering, and the need for extra careful care or dietary changes may be too much to handle for two years necessary for treatment. Why not choose Invisalign in Dunwoody instead? Braces start with affixing metal brackets to the teeth and attaching wires between them. This set up makes it difficult to remove food residue and plaque from the teeth and gums. Invisalign is completely removable. Take it before eating, then brush and floss before putting it back in! There’s much less risk for tooth decay, gum disease, or diet challenges. You know that being able to flash a brilliant smile works wonders for your own self-image, so imagine what it can do for your teen. The metallic look of braces can dim their smile. With Invisalign, the orthodontic treatment allows her beautiful teeth to show through! 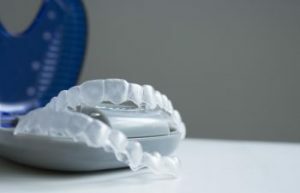 Not only can Invisalign promote a healthier smile and self-image, it also takes 25-50% less time than braces. If you’re checking out treatment for your teen, call Dunwoody Family & Cosmetic Dentistry for a consultation! We treat adults, too! Three Ways Bonding Beautifies Your SmileDid you Know Your Dentist Can Check for Oral Cancer?